Barcelona extended the gap to Real Madrid into a 8 point advantage, after seeing the Merengues dropping another 3 points in La Liga, this time against Sevilla. An early goal that came off from a corner kick near the 2nd minute of the game, has dismantled José Mourinho's strategy for this clash, as a feisty Sevilla side managed to come on top throughout most of the match. Real Madrid visited the Sánchez-Pizjuan already knowing that Barcelona had won their game at Getafe and extended the lead into a 8 point gap. Coincidentally or not, the Merengues started the game very nervously and allowed Sevilla to immediatly push them against the ropes. With only 2 minutes on the clock, Sevilla had already created a good goalscoring chance and got the opener just moments after, from a corner-kick on their right attacking side. Angel Di María forgot to mark his opponent and Trochowsky found himself with plenty of space to beat Iker Casillas with a stunning half-volley, leaving absolutely no chance for the Spanish goalkeeper to do anything about it. The two weeks break given to players to honor their international duties seems to have had a negative effect in Real Madrid. The game in Sevilla wasn't expected to be easy at all, especially when the home side puts so much intensity and energy in every loose ball throughout the match. That's precisely what happened and most of the Merengues players never managed to match the their opponent's aggressiveness levels, allowing the home side to take the lead and control most of Real Madrid's attacking initiatives. 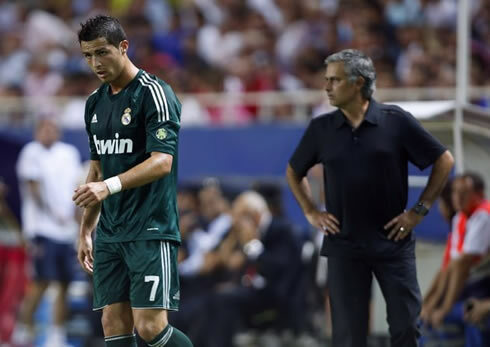 Similarly to the rest of his teammates, Cristiano Ronaldo didn't have the best of his games, as he seems to keep struggling into finding his best form and physical condition, after having arrived late this pre-season, due to the participation in the EURO 2012. Sevilla kicked off the game with a clear intention of surprising Real Madrid and catching the Merengues off guard in the early minutes of the clash. Jesús Navas was the first player to hit the target, forcing Iker Casillas to drop the ball and to make a second straight save against a rebound taken by Alvaro Negredo. This play ended up originating a corner-kick and appearently frightened Real Madrid. The Merengues then started trailing by one just a few seconds later, thanks to a Trochowski goal. Rakitic took the corner kick on the right and while everyone seems to have moved towards the first post, a huge gap appeared right in the heart of the area, allowing for someone to storm in from behind. That was precisely what happened, as Trochowski took advantage of the fact that Angel Di María forgot to mark him and attacked that empty space inside Real Madrid's penalty area. With a one-touch half-volley, the Polish-born German midfielder found no problems in beating Iker Casillas and put his side one goal up in the Sánchez-Pizjuan. Everyone expected a quick reaction from Real Madrid, but the truth is that Sevilla played this game in full throttle mode, from the beginning to the end, never allowing the Merengues to impose their typical playing style. As time passed, Sevilla slowly started to drop the intensity levels, but without ever losing control over a Real Madrid side that was always been far from impressing. 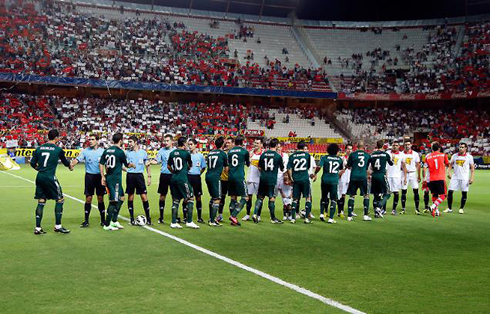 The Merengues failed an unusually high amount of passes during this game and very rarely they managed to connect fast attacking plays, in order to create danger and difficulties to Sevilla. José Mourinho made a couple of changes at half-time, leaving Di María and Mesut Ozil in the locker rooms and bringing in Modric and Benzema. However and despite a slight improvement, Real Madrid failed to get the equaliser and Sevilla's belief in pulling off a good result at their home ground helped sustaining most of the Merengues attempts to turn things around. With this loss, Real Madrid has now fallen 8 points behind Barcelona with only 4 matches played in the Spanish League and will now have to turn attentions into their UEFA Champions League 2012/13 debut, since the next home game against Manchester City will not only be a truly exciting match-up, but surely a very demanding challenge as well. 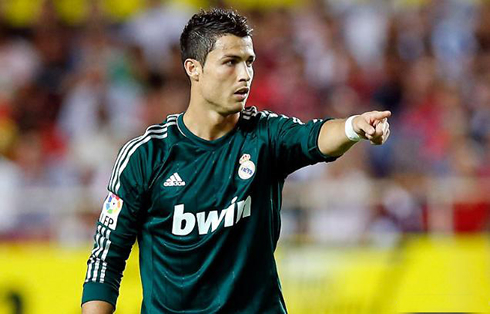 Cristiano Ronaldo's next game for Real Madrid will be against Manchester City, next Tuesday (18-09-2012). You can watch Juventus live stream, Real Madrid vs Manchester City, Borussia Dortmund vs Ajax, Reading vs Tottenham and Everton vs Newcastle, all matches provided from our football live streams section.